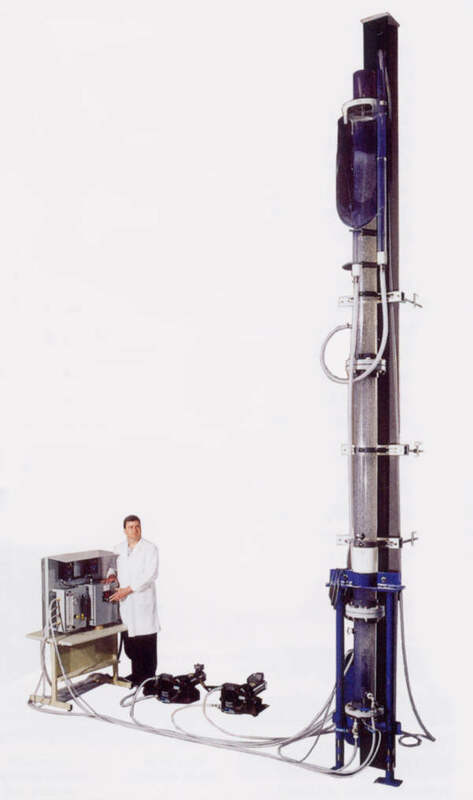 This 3 inch diameter Column Laboratory Flotation Cell is an ideal tool for evaluating the flotation characteristics of various coal and mineral feeds. The laboratory cell includes the following features: electric, variable speed feed and tailings pumps, a liquid level float switch for automatic pulp level control, electric frother metering pump, air and water flowmeters for control of bubble generator and froth wash water flow and a variable speed feed slurry mixer to assure proper feed conditioning. Constructed of acrylic and stainless steel, the Laboratory Column Flotation Cell is built to handle a wide range of feed materials. Test sample results and operating parameters can be directly scaled up to determine full sized column flotation cell performance and requirements. The design of the patented Bubble Generator System permits cleaning or replacement of internal generator parts without disrupting column operation. 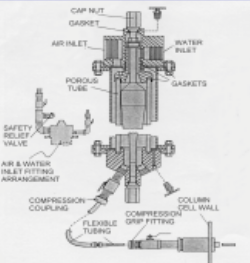 Replacement of parts simply requires closing inlet and outlet valves, removing generator top, disassembly and removal of worn porous tube, installation of replacement porous tube and reassembly. The removal of any bubble distribution tube from the column simply requires closing the generator outlet valve, loosening compression grip fitting, with-drawing tube from column and closing the column inlet valve prior to complete tube withdrawal.